We’d love your help. Let us know what’s wrong with this preview of The Age of Entanglement by Louisa Gilder. A brilliantly original and richly illuminating exploration of entanglement, the seemingly telepathic communication between two separated particles—one of the fundamental concepts of quantum physics. In 1935, in what would become the most cited of all of his papers, Albert Einstein showed that quantum mechanics predicted such a correlation, which he dubbed “spooky action at A brilliantly original and richly illuminating exploration of entanglement, the seemingly telepathic communication between two separated particles—one of the fundamental concepts of quantum physics. In 1935, in what would become the most cited of all of his papers, Albert Einstein showed that quantum mechanics predicted such a correlation, which he dubbed “spooky action at a distance.” In that same year, Erwin Schrödinger christened this spooky correlation “entanglement.” Yet its existence wasn’t firmly established until 1964, in a groundbreaking paper by the Irish physicist John Bell. What happened during those years and what has happened since to refine the understanding of this phenomenon is the fascinating story told here. We move from a coffee shop in Zurich, where Einstein and Max von Laue discuss the madness of quantum theory, to a bar in Brazil, as David Bohm and Richard Feynman chat over cervejas. We travel to the campuses of American universities—from J. Robert Oppenheimer’s Berkeley to the Princeton of Einstein and Bohm to Bell’s Stanford sabbatical—and we visit centers of European physics: Copenhagen, home to Bohr’s famous institute, and Munich, where Werner Heisenberg and Wolfgang Pauli picnic on cheese and heady discussions of electron orbits. To ask other readers questions about The Age of Entanglement, please sign up. Very, very good. Gilder does an excellent job of capturing the personality, fervor, and excitement of a bunch of men who reinvented the universe. This book gives a cogent and smart account of how we got some very complex ideas. Read it. In The Age of Entanglement, Louisa Gilder sketches and humanizes one of the most baffling ideas of modern science -- the concept of entanglement in quantum mechanics. Einstein famously called entanglement "spooky action-at-a distance, and battled fruitlessly for the last two decades of his life to rebut it. Entanglement implies that particles, even if separated by large distances, can "communicate" with each other simultaneously. It also implies that photons, electrons, atoms, indeed all matter, In The Age of Entanglement, Louisa Gilder sketches and humanizes one of the most baffling ideas of modern science -- the concept of entanglement in quantum mechanics. Einstein famously called entanglement "spooky action-at-a distance, and battled fruitlessly for the last two decades of his life to rebut it. Entanglement implies that particles, even if separated by large distances, can "communicate" with each other simultaneously. It also implies that photons, electrons, atoms, indeed all matter, including such things as baseballs and cars, behave as both particles and waves, that particles can just pop into existence, and that things may have no reality until measured or observed. These concepts fly in the face of many of the underlying pillars of classical physics, as well as some of the most firmly rooted ideas of our ordinary life, such as causation, the flow of time, and that cause precedes effect. Quantum mechanics is full of weirdness, such as faster than light propagation of information and that two observers can each observe the same event as occurring before the other observer observes it. 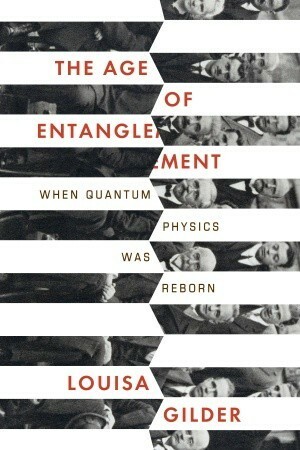 In In The Age of Entanglement, Gilder illuminates entanglement through imagined or reconstructed conversations between the physicists who created the edifice of quantum mechanics. Using the diaries, notebooks, books and recollections of those physicists and their friends, collegues and families, Gilder draws a compelling picture of the history of an idea and the frustration and angst it caused in those who developed it. "But the difficulty really is psychological and exists in the perpetual torment that results from your saying to yourslef, 'But how can it be like that?' -- which is a reflection of an uncontrolled and utterly vain desire to see it in terms of something familiar....Do not keep saying to yourself, 'But how can it be like that?' because you will get 'down the drain,' into a blind alley from which nobody has yet escaped." Yikes. This isn't history; it's an awkward fictionalization, a conceit that collapses science into an entangled pile of clichés. Gilder chose an interesting way to relate material that is often unrelatable. Many famous physicists are known for asserting that no one understands quantum physics. My favorite Feynman quote is, "There was a time when the newspapers said that only twelve men understood the theory of relativity. I do not believe there ever was such a time. There might have been a time when only one man did, because he was the only guy who caught on, before he wrote his paper. But after people read the paper a lo Gilder chose an interesting way to relate material that is often unrelatable. Many famous physicists are known for asserting that no one understands quantum physics. My favorite Feynman quote is, "There was a time when the newspapers said that only twelve men understood the theory of relativity. I do not believe there ever was such a time. There might have been a time when only one man did, because he was the only guy who caught on, before he wrote his paper. But after people read the paper a lot of people understood the theory of relativity in some way or other, certainly more than twelve. On the other hand, I think I can safely say that nobody understands quantum mechanics." The concepts of quantum mechanics have fascinated me for a great many years. I’ve read dozens of books on the subject but am no closer to grasping the concepts underlying a mystery that perplexed Einstein himself until the day he died. Einstein spent his entire life wrestling with the issues raised by the initial discovery of quantum mechanics in the year 1900. He was never really able to move past his initial frustration with the fact that under certain physical circumstances, two individual subatomic particles, far apart from each other, act in concert with each other in a way that violates all known explanations. These two particles seem to influence each other simultaneously and remotely; communicating with each other by an unknown mechanism that would far exceed the speed of light. Einstein ridiculed this phenomenon as “spooky action-at-a-distance” and called it “a sort of telepathic coupling” in his initial efforts to argue that someone must have had a few too many drinks down at the lab. What may be in store for us is a shock as big as the one that came to the citizens of Flatland in one of my absolute favorite books: The very brief (less than 50 pages) story of Flatland: A Romance of Many Dimensions, by Edwin Abbott. In Flatland, Abbott describes a world of people who live in a two dimensional world – a flat plane -- where men are polygons and women are line segments. They have no concept of up or down. And then, one day, a three dimensional sphere visits them and it rocks their world as it demonstrates how what they see in two dimensions is proof of a third dimension. Such a world-rocking is likely somewhere in our future, and some very smart folks (string theorists) think that many additional dimensions exist and that all matter (and especially those spooky particles) is connected through one of those other dimensions. After the initial frustration at this artifice I found myself captivated by the story of how Einstein, Schrödinger, Oppenheimer, von Neumann, Bohm, Feynman, and of course Bell devoted much of their lives to thinking about and discussing the phenomenon of quantum entanglement. Put another way, I did not want to learn about the historical context of their respective efforts and how they overlapped and interacted with each other. But I’m glad I did. "The wave function ψ described an electron in in three dimensions: perfect. But it described a pair of electrons as a single wave in six dimensions: nonsense." Nonsense was the prevailing point of view at the time, which was "fixed" by Max Born interpreting the equation as the probability of finding the particle somewhere. Entanglement, the theme of the book, is defined right in the equation - two particles are part of the same wave. But what about the six dimensions? Perhaps we have two 3-dimensional universes? Strangely this "many worlds" interpretation of quantum mechanics is barely mentioned in the book. The delay in discovering entanglement is attributed to Niels Bohr and his philosophy that it is not possible to understand what is happening in quantum mechanics and it is even wrong to try. Worse was the notion of the observer actually being essential to any observation, as opposed to the observation requiring interaction of the particle with photons, affecting the result. John Bell is quoted as asking, "Was the wave function of the world waiting to jump for billions of years until a single celled living creature appeared? Or did it have to wait a little longer for a better system with a PhD?" Niels Bohr's powerful personality ensured that most physicists accepted his view, and that which he said cannot be questioned was not questioned. Again, Bell says of those who did question, "Their arguments were not refuted, they were simply trampled on." Blinded by this philosophy, Bohr's followers ignored the evidence for entanglement. It was the skeptic Albert Einstein who identified it in his famous 1935 "EPR" paper. He tried to defend realism by showing that QM was flawed by predicting spooky action at a great distance, faster than light can travel. But even Einstein was dismissed and ignored for many decades. A more forceful defense of realism in QM can be found in The Beginning of Infinity by physicist David Deutch. Perhaps the central character in the book is John Bell, also a fierce defender of realism. In his spare time, because no one else cared, he explored the EPR result and developed his Bell's Inequality. This mathematically proved that the results of quantum mechanics are not compatible with "locality". Thus two particles far apart can be instantaneously connected, just as the Schrödinger equation suggests. We can keep realism only if we accept action at a distance. Even after reading this book, I don't understand quantum physics - but that wasn't the author's purpose. She focused on the history of the research and the relationships between the scientists. This book isn't for everyone. You don't have to know a lot of math or physics, but I can't imagine you would enjoy this book without a significant math and physics background. In case you aren't going to read i "If you can't explain it to a six year old, you don't understand it yourself." 1. A lot of the book was based on letters written by the scientists to each other. No one writes letters anymore - does that mean we won't have a record of what people are thinking anymore? Or will emails serve the same purpose? In 1989, the year before he died, John Bell gave the "speech of his career" to his fellow physicists, taking issue with the standard interpretation of quantum physics: "It would seem that the theory is exclusively concerned about 'results of measurement' and has nothing to say about anything else. What exactly qualifies some physical systems to play the role of 'measurer'? Was the wavefunction of the world waiting to jump for thousands of millions of years until a single-celled living creature a In 1989, the year before he died, John Bell gave the "speech of his career" to his fellow physicists, taking issue with the standard interpretation of quantum physics: "It would seem that the theory is exclusively concerned about 'results of measurement' and has nothing to say about anything else. What exactly qualifies some physical systems to play the role of 'measurer'? Was the wavefunction of the world waiting to jump for thousands of millions of years until a single-celled living creature appeared? Or did it have to wait a little longer, for some better qualified system...with a Ph.D.? If the theory is to apply to anything but highly idealized laboratory operations, are we not obliged to admit that more or less 'measurement-like' processes are going on more or less all the time, more or less everywhere?" In The Age of Entanglement, Louisa Gilder presents us with quantum physics not as a textbook abstraction, but as a vigorous debate among brilliant men and women trying to make sense of the most baffling of mysteries. Gilder has performed a great service by assembling a vast collection of letters, conversations, speeches and anecdotes to tell this story in a fascinating way. Over many years of contentious theorizing and difficult experimentation, physicists came to grips with the implications of quantum mechanics: either little things are not fully real until they are observed by big things like us (the view attacked by Bell); or maybe they are real in some mysterious way, entangled in a hidden web of nonlocal connections. Quantum physics challenges the traditional scientific view of a world consisting of separate, independently existing objects exerting forces on one another from point to point to point in space. I felt a little frustrated with this book. First, let me say that it is such a great idea. Exploring the history of the theory of quantum mechanics via the difficulties surrounding entanglement is brilliant. I also think this book does a good job discussing some of the serious personal and political dramas these researchers faced (e.g. the rise of the Nazis and the second red scare in the US). That being said, I didn't like that the science was often skipped. When it wasn't, I thought it was con I felt a little frustrated with this book. First, let me say that it is such a great idea. Exploring the history of the theory of quantum mechanics via the difficulties surrounding entanglement is brilliant. I also think this book does a good job discussing some of the serious personal and political dramas these researchers faced (e.g. the rise of the Nazis and the second red scare in the US). That being said, I didn't like that the science was often skipped. When it wasn't, I thought it was confusing (with the one exception of quantum information at the end). Maybe that's unavoidable with this topic? Perhaps this book is best meant for physicists interested in the history of the subject. I think a general audience would find this book boring and, therefore, difficult to finish. What were you doing seven years out of college? Writing a page-turner, science history book like this one? No slacker she, Louisa Gilder was polishing off this page-turning narrative of ninety-six years of the development of the Quantum Theory. You'll need to read parts of this book three times to understand the mysterious science displayed here . . . but keep at it: the intellectual rewards provided by this book are real and lasting. I'm eager to read her next work and appreciate the hours of m What were you doing seven years out of college? Writing a page-turner, science history book like this one? No slacker she, Louisa Gilder was polishing off this page-turning narrative of ninety-six years of the development of the Quantum Theory. You'll need to read parts of this book three times to understand the mysterious science displayed here . . . but keep at it: the intellectual rewards provided by this book are real and lasting. I'm eager to read her next work and appreciate the hours of mental enlargement she gave me through reading this stunning history. I loved this book when I read it several years ago, and enjoyed it even more on a recent reread. The author does a masterful job of weaving human characters, personalities, and historic background together with the revolutionary ideas the protagonists were pursuing. The physical and quantum mechanical concepts are very well explained. This is one of my favorite books and I look forward to more from this author. I have a layman's fascination with quantum mechanics. I loved this book because it introduced me to the concepts in quantum mechanics in an understandable way and it is a charming story of the interaction between the great physicists of the 20th century. A fantastic human and scientific history of quantum mechanics. The author obviously (and admittedly) took a large number of liberties on the "details" of historic conversations, but it humanized the history in a very nice way. I found it somewhat repetitive, but this is realistic - once someone coins a good turn of phrase, they tend to use it several times. I haven't read a "human history of quantum" in a while, but this is one of the best from those I remember. Fantastic read. Rich narrative and vivid description of a complete arc of epic debates in the Physics community helps unveil the curtain on how the biggest and now mainstream ideas came to be despite all the struggle and long periods of being profoundly misunderstood. Getting a glimpse into the nature of personal relationships between the biggest scientific names is an added bonus. In this fascinating account of the topsy-turvy world of quantum mechanics, Louisa Gilder conveys the attempt of the human imagination to logically wrestle with the sometimes bizarre, as experienced and narrated by the theories' most famous protagonists. Relying almost entirely on actual conversational material between these scientists, or else the correspondence between them, this book provides a glimpse into how physics experienced a transformational change as the everyday perceptual world and In this fascinating account of the topsy-turvy world of quantum mechanics, Louisa Gilder conveys the attempt of the human imagination to logically wrestle with the sometimes bizarre, as experienced and narrated by the theories' most famous protagonists. Relying almost entirely on actual conversational material between these scientists, or else the correspondence between them, this book provides a glimpse into how physics experienced a transformational change as the everyday perceptual world and its supporting assumptions collapsed quickly as science delved into the world of the extremely small. The dual particle/wave theories of matter and its associated mathematics led to a seemingly puzzling conclusion - that subatomic particles are dominated by 'entanglement' - a process that begins when two such particles interact, and then forever lose their separated existence. Irrespective of the distance that separates them, the tweaking of one particle produces an instant response in the other, a conclusion that Einstein termed "spooky action at a distance". This book cogently summarizes how the smartest scientists at the forefront of developing these theories struggled to make sense of its implications. The beauty of Gilder's approach is that by resorting to actual written or spoken material, the reader is transported into the instant of the dialogue and becomes a passive participant in the exchange. As a result, one experiences the deepest levels of frustration these scientists felt, either in accepting a colleague's interpretation or in the stubbornness of their own world views. "You are the only person with whom I am actually willing to come to terms," laments Einstein in a letter to his contemporary, Schrodinger, "Almost all the other fellows do not look from the facts to the theory but from the theory to the facts; they cannot get out of the network of already accepted concepts; instead, comically, they only wriggle about inside'. This account brilliantly combines as a work of history, an intermediate course in quantum mechanics, as well as a biography of scientific personalities, all comprehensively elucidated in a single work. Developments and theories like Heisenberg's uncertainty principle, and Schrodinger's wavefunction collapse get prominent coverage, but with the often missing mental map of what the discoverers were going through before enunciating these to a broader audience. "We have always said so glibly," recorded a not-so-sure Heisenberg, "that the path of an electron in the cloud chamber can be observed. But perhaps what we really observed was something much less. We merely saw a series of discrete and ill-defined spots through which the electron had passed. In fact, all we do see in the cloud chamber are individual water droplets which must certainly be larger than an electron. The right question should therefore be: Can quantum mechanics represent the fact that an electron finds itself approximately in a given place and that it moves approximately with a given velocity, and can we make these approximations so close that they do not cause experimental difficulties?" An additional contribution made by Gilder is the inclusion of several concluding chapters that take the history of quantum exploration into the more recent work of scientists like Bohm and Bell. Gilder presents an exhaustive review of the thinking and debates that broke out following the publication of the well-known EPR (Einstein-Podolsky-Rosen) paper in 1935; the introduction of hidden variables by David Bohm, that finally culminated in the famous inequality of Bell that restricts the extent to which two unconnected particles can be correlated. Experiments by Alain Aspect, and more recently, by Greenberger, Horne, and Zellinger (all elegantly summarized by Gilder) conclusively established that quantum mechanics routinely violates the requirements established by Bell's Theorem. Finally, quantum entanglement had been definitively established. In the final chapter, Gilder briefly introduces the reader to the world of quantum computing and how information transfer processes, especially in cryptographic science, eerily parallel quantum happenings and interactions. History of the development of the Quantum Theory. The book takes an unusual approach of recounting the history by letting all the main actors speak. The dialogs between Rutherford, Einstein, Heisenberg, Bohr, Pauli etc etc have been derived from letters, biographies and other sources. The idea is great to tell this story through the words of the main players. However, the way Louisa has done is VERY uneven. The first half recounts the early story and ends roughly in the 50's around the time when Ei History of the development of the Quantum Theory. The first half recounts the early story and ends roughly in the 50's around the time when Einstein dies. This half is extremely choppy, many abrupt context changes and the explanations of the physical phenomena as well as the different theoretical approaches is very confusing. I doubt anybody who hasn't been exposed to this material can make any rhyme or reason out of this. If one is patient, the explanations are refined now and again later and slowly a more digestible picture is emerging. But, to be honest, I wanted to stop reading more than once. What kept me going was the nostalgia of much better accounts of this story that I read in 70's and another review that said at the beginning of the second half, "the clouds separate and a totally different book starts". This second half was indeed much better. If you just look at the layout of the text you will notice that there are long paragraphs that indicate a real narrative vs. the choppy first half with many 2-3 line sections. Early last century, Einstein and Bohr, the two grand masters of quantum theory, debated its meaning. Einstein declared, based on the clear implications of quantum mathematics, that quantum effects were non local, entailing "spooky action at a distance," correlations at faster than the speed of light, and thus he challenged the completeness and coherence of quantum theory. Bohr responded by citing the correspondence principle, which says that at larger scales quantum phenomena assimilate to class Early last century, Einstein and Bohr, the two grand masters of quantum theory, debated its meaning. Einstein declared, based on the clear implications of quantum mathematics, that quantum effects were non local, entailing "spooky action at a distance," correlations at faster than the speed of light, and thus he challenged the completeness and coherence of quantum theory. Bohr responded by citing the correspondence principle, which says that at larger scales quantum phenomena assimilate to classical models, and the principle of complementarity, which asserts that quantum entities can have paradoxical characteristics that are both real but that cannot be reconciled by conventional reasoning. The Age of Entanglement shows that hundreds of experiments conducted over the last thirty years have proven both of these titans wrong. Quantum theory is inexorably non-local by normal standards and it scales across the universe beyond time and space in a phenomenon called entanglement. This fascinating book retells the history of Twentieth Century physics to accommodate the fact that the two greatest quantum theorists were both right and wrong in intriguing ways and tells how entanglement is now manifested in technologies such as quantum computing and quantum cryptography. The book reads like a novel, full of dialogs that lead the reader into ever deeper levels of understanding of the great mysteries of physics. I think that my feelings on this book are largely shaped by the fact that I have a PhD in physics. Despite the fact that I know little about the history and development of quantum mechanics (only what you learn in passing by learning quantum mechanics), much of this book still felt familiar. So many of the central figures are characters in physics lore and legend, that they weren't that surprising. Even those I didn't know, I still mostly recognized the names (if only in connection with this equ I think that my feelings on this book are largely shaped by the fact that I have a PhD in physics. Despite the fact that I know little about the history and development of quantum mechanics (only what you learn in passing by learning quantum mechanics), much of this book still felt familiar. So many of the central figures are characters in physics lore and legend, that they weren't that surprising. Even those I didn't know, I still mostly recognized the names (if only in connection with this equation or that theory or textbook). This was a thoroughly enjoyable book. The premise was a little odd to me, how the history was presented, in these fabricated conversations using real words taken from different bits of primary text. But once I got over that, it felt fairly natural. For me, it was like seeing an old familiar friend. I haven't really done anything with quantum mechanics in years, and this reminded me of a lot of the wonder, and sheer strangeness, that I felt when first learning it. I really really wanted to like this book a lot. It is copiously, even obcessively referenced. Rather than following each of the giants of quantum thory as independent lines, the author tries to demonstrate the discussions and interdependence of these geniouses, due to training, personality, and creativity. The time covered is from about 1920 to 2006. This is one of the most exciting periods of physics history, fundamentally forcing scientists to question all previous notions of mechanics, and to I really really wanted to like this book a lot. It is copiously, even obcessively referenced. Rather than following each of the giants of quantum thory as independent lines, the author tries to demonstrate the discussions and interdependence of these geniouses, due to training, personality, and creativity. The time covered is from about 1920 to 2006. This is one of the most exciting periods of physics history, fundamentally forcing scientists to question all previous notions of mechanics, and to try to explain the findings that happen at the extremes of time, space, and velocity. The author has taken a wonderful, creative, and original approach, even more impressive as a first book. I applaud her efforts. Her efforts included approachable explaination of some rather indescribable findings (superb job), and to share some puns and other trickery of the conversations and correspondences, many of which were in German (also an excellent job). Un libro complejo, presentado de una manera interesante pero que lo hace un poco lento hasta la mitad del libro. La historia del "Entanglement" es posiblemente igual de importante que el concepto por si mismo y como los cientificos mas brillantes de nuestra época tuvieron tanto problema aceptando que es un fenómeno que sucede, pero no sabemos por que y lo que es peor, pone en entredicho uno de los conceptos clave de la relatividad ya que se "demuestra" que algo viaja más rápido que la luz. Los con Un libro complejo, presentado de una manera interesante pero que lo hace un poco lento hasta la mitad del libro. Los conceptos no son sencillos y ciertamente ayuda saber algo de física, claro que ayuda mucho más tener la mente abierta; aunque ciertamente puede consolar el hecho de que los científicos más famosos de la historia e incluso los actuales siguen teniendo esas dudas al respecto de la Física Cuantica. Gilder manages to weave the science (and its evolution), personalities, and the histories of the day together to present the most extensive (and engrossing) history of quantum physics that I could imagine. Notably, she goes much deeper into the controversies and interplay between the greats, and their intellectual heirs. I particularly liked that she took the work well beyond Einstein, Bohr, Heisenberg, and Schroedinger - all the way to the present day discussions about quantum computing and enc Gilder manages to weave the science (and its evolution), personalities, and the histories of the day together to present the most extensive (and engrossing) history of quantum physics that I could imagine. Notably, she goes much deeper into the controversies and interplay between the greats, and their intellectual heirs. I particularly liked that she took the work well beyond Einstein, Bohr, Heisenberg, and Schroedinger - all the way to the present day discussions about quantum computing and encryption. The book got much, much better towards the latter half. I didn't like the reconstructed historical conversations of the early players in quantum mechanics (too often it felt like a cut-and-paste substitute for analysis or explanation by the author). Towards the end, when Gilder relied more on her own interviews with scientists, the book became much, much stronger. The second half of the book proves that Gilder can be an excellent science writer. This book would have been better if the author had c The book got much, much better towards the latter half. This book would have been better if the author had condensed her section on the early history of quantum mechanics (which has been already been done in many other books, by historians with a better background in the subject) and spent more time explaining the science of entanglement post-Bell theory that she discusses in the second half of the book. I've gone on a cosmology bender in recent months, trying to get beyond my OMG mentality about the subject, and this kind, generous, humane book was a gift. It wasn't easy for me to keep all the personalities separate, but I came to see these famous physicists as a big, happy, quarreling family that I only wish I could be a part of. I'm up for adoption, guys! --And Einstein...well, that's next, a really good biography of The Man. PS: When a cousin visited earlier this summer, I waxed eloquent on I've gone on a cosmology bender in recent months, trying to get beyond my OMG mentality about the subject, and this kind, generous, humane book was a gift. It wasn't easy for me to keep all the personalities separate, but I came to see these famous physicists as a big, happy, quarreling family that I only wish I could be a part of. I'm up for adoption, guys! --And Einstein...well, that's next, a really good biography of The Man.